Youth Citizens Police Academy! - Everything Danville, California! School Resource Officers are already accepting applications for this summer’s Youth Citizens Police Academy. The academy is for youth grades 9-12. The academy will be held from June 10-13, 2019. 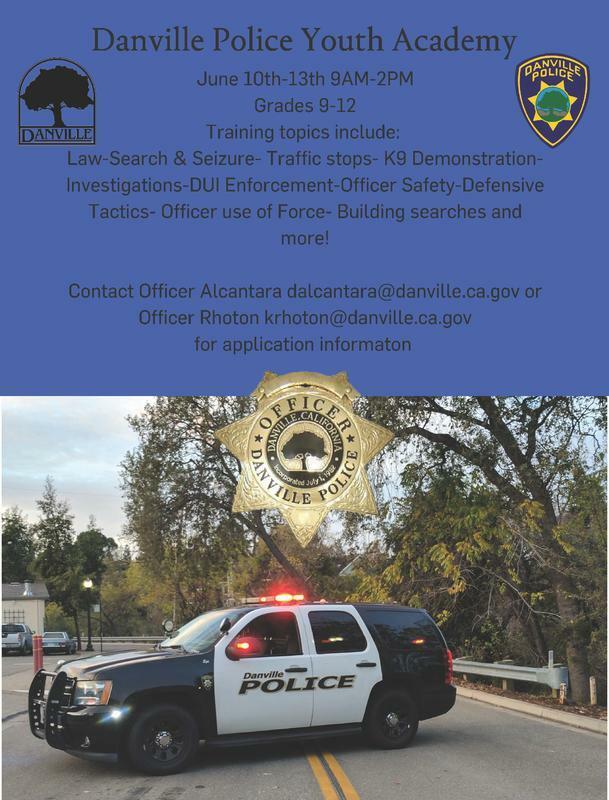 Classes are held from 9 am – 2 pm, with training topics that include Traffic Stops, K9 demos, Search and Seizure laws, Officer Safety, Defensive Tactics, Building Searches and more. For those interested, contact Officer Darren Alcantara at [email protected] or Officer Kyle Rhoton at [email protected].